Images 13 shows that this current Duo is Romweber's strongest, most empathetic pairing since the days of the Flat Duo Jets. The near 30-year career of Dex Romweber puts paid to the idea that the roots of rock and roll are dead and gone. Since bursting on the scene with the Flat Duo Jets, Romweber's frenetic rock rave-ups and contemplative country blues have built upon and added to the rockabilly foundations laid by the likes of Gene Vincent and Big John Taylor. 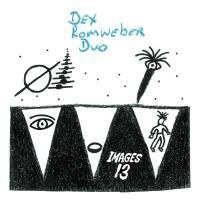 While he no longer sounds like he's burning the candle at both ends as he did in the Flat Duo Jets days, there's plenty of fire on Images 13, the third album from Dex and his sister Sara. Album opener "Roll On" is a dirty grinder of a song, its feral energy almost palpable. It sounds like a nod to his past, a tune that easily could have appeared on any of the Flat Duo Jets mid-'90s albums. It's about his guitar tone, his snarling vocal, roger dal fuzz that scuzzies up the chorus. There's danger here, but for the listener not the performer. Never is that clearer than on "Prelude in G Minor", where the threat is palpable and disturbingly weird. This instrumental finds his playing at its most menacing – no one else so deftly uses reverb to send a chill down the spine – and Sara at her snappiest. The snare cracks like a gunshot, the soft snare hits rising, climbing to crash like a sap to the back of the head. This is the prelude to a kill. Images 13 isn't all darkness and danger, though with Romweber it's always good to remember that the brightest light casts the deepest shadows. When the album isn't treading a perilous path, as on the wonderful cover of the Who's "So Sad About Us", it's easy to imagine a time and place where Romweber was a chart-topping star. His open-hearted take on "We'll Be Together Again" harkens back to Roger Daltrey's singing with the Who in those halcyon early days, and it might be the sweetest performance he's ever recorded. That is, until you realize it was written for Eddie Cochran by his girlfriend Sharon Sheeley after she survived the fatal crash that took his life. The shadow always looms large. Yet for all his obvious strengths as a singer, he may be an even better guitarist. He's always been a nimble player, whether with rapid runs, fine picking, or with manically strummed chords. But regardless of tempo or tone, Romweber plays with an understated lyricism. As he's aged, that has come even more to the fore. As a result, he has finally found the perfect harmonic support and counter for those powerful vocals. "I Don't Want to Listen" finds him digging deep into his lower vocal register, with the guitar holding the highs in bright relief, before dropping in turn as his voice climbs up near it's breaking point. The guitar solo, a simple melody with just a few bent notes, ties the highs and lows in a pretty bow that anchors both the song and the album as a whole. Images 13 isn't a grand departure from the many albums that have preceded it. It isn't the culmination of decades of work, the masterpiece that neatly summarizes and supplants the nearly 20 albums that precede it. However, it does show that this current Duo is his strongest, most empathetic pairing since the days of the Flat Duo Jets. Sara gives her brother the space he needs without freeing him from the confines of the song, and in turn he gives her the space to shine, like on the aforementioned "Prelude in G Minor". The Dex Romweber Duo prove once again the roots of rock and roll are still planted in fertile artistic soil.